next to Granger & Co. Follow the signs to St Pancras International. The underground walkway has an exit on the right just before you reach St Pancras International leading to Pancras Square. This exit has a multicoloured walkway leading to an escalator that comes up at Pancras Square. Upon reaching the top of the escalator turn left at the Nike Store and then left again at “Notes” cafeteria. 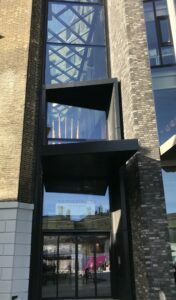 Take a right at Granger & Co. and SEVEN PANCRAS SQUARE is the slim glass facade building on your right after the restaurant. The building is also labelled the Stanley building. Directions from Circle, Hammersmith & City, and Metropolitan lines: Follow the exit signs to St Pancras International. Walk straight through St Pancras railway station till the end of the concourse. Take a right at “Benugo” cafeteria leading to platforms 11 – 13. Exit the terminal and cross over the road. Walk down the path on the left of the German Gymnasium restaurant. SEVEN PANCRAS SQAURE will be the building with a slim glass facade on your left just before Granger & Co. 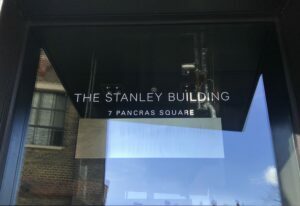 The building is also labelled the Stanley building.